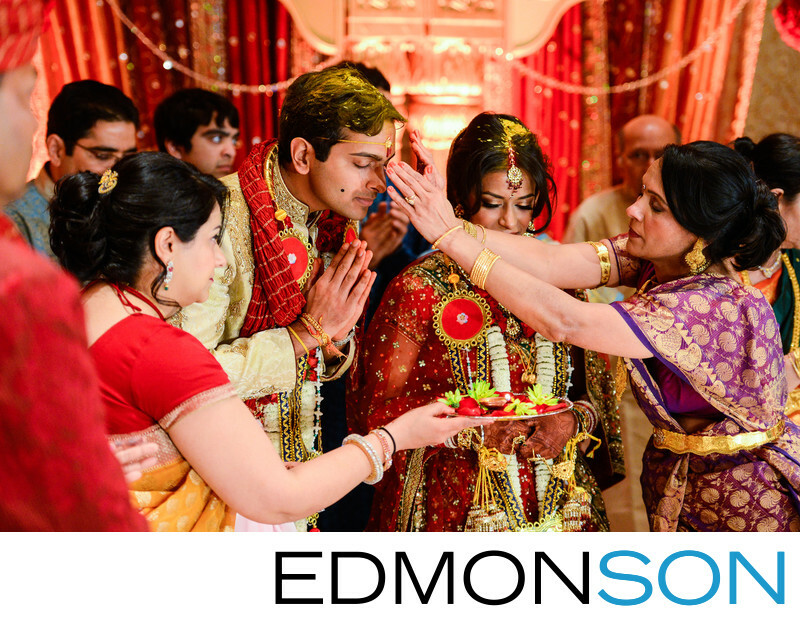 At the Hilton Anatole in Dallas, TX, a popular venue for Indian Weddings in DFW, the bride and groom receive blessings from their family, specifically their mothers. The two family's blended their traditions, with the Punjabi bride's family bringing customs from North India and the Groom's family from South India. We love capturing Indian weddings not only because they are so colorful but because of the wonderful emotions on display. For a more detailed look at the nuances of a Hindu wedding ceremony, check out our guide to Indian Weddings. On the wedding day, the bride and groom prepare for the ceremony separately with one of the notable actions being the Baraat (a wonderful celebration of the groom's arrival full of music and dancing ending with the receiving of the groom by the bride's parents). Once the groom arrives, the nuptials begin with the Ganesh Puja (Prayer), followed by the dramatic entrance of the bride. During the ceremony, many symbolic acts are performed that bind the couple together including garland exchanges, placing of hands, tying knots, walking around a small fire, ring exchanges and the 7 steps. If you are searching for a wedding venue to host your Indian or South Asian wedding in DFW and planning on inviting more than 500 guests, the Hilton Anatole is a wonderful option. Not only are they very familiar and experienced but they have the capacity to host a variety of functions in their numerous ballroom. Their incredible collection of South Asian Art provides a built-in backdrop for your guests to enjoy. The Anatole is conveniently located close to downtown Dallas at 2201 N Stemmons Fwy, Dallas, TX 75207. 1/160; f/3.5; ISO 4000; 85.0 mm.